This looks bad, doesn't it? Let's take a closer look. 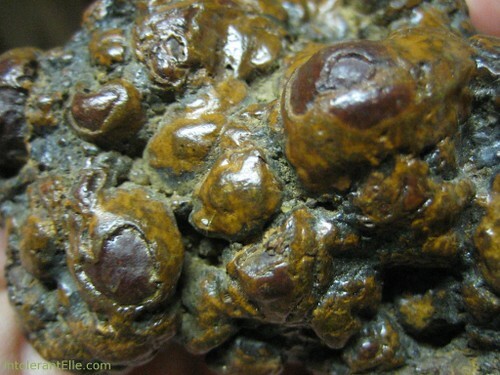 As far as I can tell, there are seed pods or some other bean-like structure in the coprolite, indicating a herbivore of some kind deposited this. However, being that details do not often show up in rocks unless they are wet, let me find the nearest water source so we can have a more detailed look. 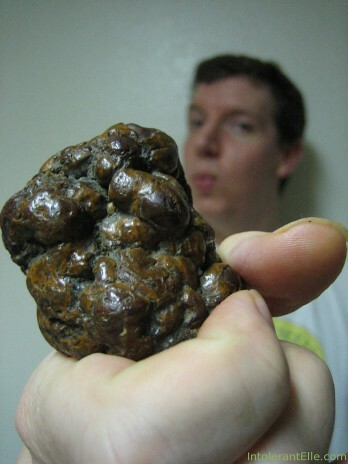 OK, so that whole setup was just an excuse to put a picture of me licking fosilized poo up on my blog. However, those who live near me will need to see the coprolite, touch the coprolite, but licking it is purely optional. Even with all the fun and games, this trace fossil is fascinating and definitely deserves to be displayed under the rear end of a fossil of a smaller herbivorous dinosaur.